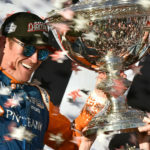 Scott Dixon’s fifth IndyCar Series championship adds another layer to his hero status in New Zealand motorsport. The race driver originally from Manurewa ran a steady, mistake-free race to finish second in the IndyCar season finale, the Grand Prix of Sonoma, to race winner Ryan Hunter-Reay. The result was more than enough to give the No. 9 PNC Bank Chip..